Introduction. 1. Non-Negative Operators. 2. Differential Operators. 3. The Balakrishnan Operator. 4. An Extension of the Hirsch Functional Calculus. 5. 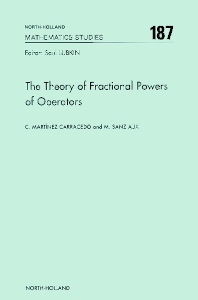 Fractional Powers of Operators. 6. Domains, Uniqueness and the Cauchy Problem. 7. Negative and Imaginary Powers. 8. The Dore-Vennis Theorem. 9. Functional Calculus for Co-groups. 10. Imaginary Powers on Hilbert Spaces. 11. Fractional Powers and Interpolation Spaces. 12. Fractional Powers of some Differential Operators. Appendix. Notations. Bibliography. This book makes available to researchers and advanced graduates a simple and direct presentation of the fundamental aspects of the theory of fractional powers of non-negative operators, which have important links with partial differential equations and harmonic analysis. For the first time ever, a book deals with this subject monographically, despite the large number of papers written on it during the second half of the century. The first chapters are concerned with the construction of a basic theory of fractional powers and study the classic questions in that respect. A new and distinct feature is that the approach adopted has allowed the extension of this theory to locally convex spaces, thereby including certain differential operators, which appear naturally in distribution spaces. The bulk of the second part of the book is dedicated to powers with pure imaginary exponents, which have been the focus of research in recent years, ever since the publication in 1987 of the now classic paper by G.Dore and A.Venni. Special care has been taken to give versions of the results with more accurate hypotheses, particularly with respect to the density of the domain or the range of the operator. The authors have made a point of making the text clear and self-contained. Accordingly, an extensive appendix contains the material on real and functional analysis used and, at the end of each chapter there are detailed historical and bibliographical notes in order to understand the development and current state of research into the questions dealt with.